One of the many joys of owning a dog is getting out in all weathers. Louis loves the cold, sniffing occupies him. We walked past all the posh houses (very few decorations up), past the golf club, past bramhall park and then home. It just started snowing which is still a novelty to Louis. Several dogs out today all very well behaved.One lady had two huskies and they were content to walk with her, no dragging at all. We arrived home to guests Carole and Phil, Louis was in his element he said hello very nicely had his dinner then surfed the table for minced pies. I can hear a contented little pooch in his bed charging up for his third and final walk. 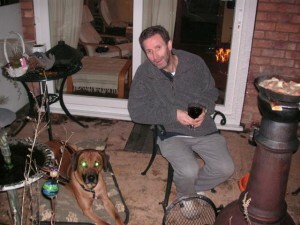 Andy away, he left us this morning after a wonderful walk with Louis and a very well cooked sausage sandwich. Louis is fast asleep on his sofa, we miss the chaos Andy brings to our happy little home. This week is going to drag; I will amuse us, but I am finding it hard, Louis just isn’t as pesty as his dad. Louis’ trainer called to say he has a chance to redeem himself on Tuesday as we can’t have the training hall on Thursday. I do hope Louis thinks with his head and gets some well needed training in, his test is on the 19th June. We walked for miles today up to Cheadle Hulme and through Bramhall park stopping off at my mums for a well deserved cup of tea and a little sympathy. Louis got spoilt too, he had half my salmon buttie. I couldn’t walk down story-ville this evening as I’m in the first phase of missing Andy. Andy just phoned, he’s in Chicago and just about to get on to his next flight. Hurry home, your boy and I are c–p without you. My blog will be more Louis orientated tomorrow as I will have adjusted to single life again. Sue and I have been very good diet wise and not had a barbecue or a sausage fest for a long time. 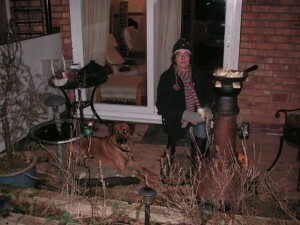 We used to regularly cook sausages on our chimenea; especially during the winter. So…now we are near our target weights we decided to sit out one night last week and treat ourselves to a fry up (low fat sausages of course). It was about 5 below zero; bloody cold if you ask me. Louis wouldn’t miss out on sausages (low fat or otherwise) for anything so he decided to camp out with us. It’s that time of year when we post a pic of Sid in Australia drinking a huge Guinness. That will come. 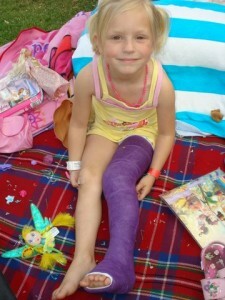 Unfortunately Sid & Sue’s daughter Amaya took a tumble on the first day of their holidays in Adelaide and broke her leg. Poor thing. Here she is looking chirpy in her purple cast that she’ll have to wear for a few weeks. Apparently it didn’t stop her from running around and enjoying the rest of the holidays.